Special Events Made FUN & EASY for your Company! 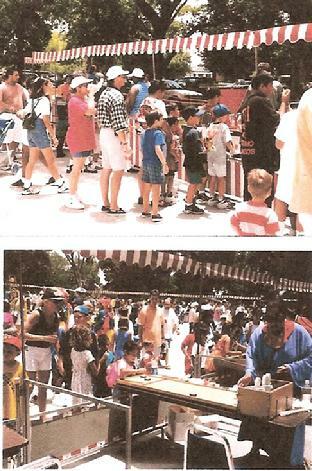 The FUN FAIR consists of a midway of colorful booths with skill games and prizes. A FUN FAIR provides exciting and challenging entertainment for the attendees of your event. We can program the prizes to appeal to all age ranges, from kids to adults and Fund Resources will make sure that the participants go away with great prizes appropriate to the theme of your event! Prices are quoted using our "Hinge Booths", which provide a colorful red-and-white-striped front with valance but no cover. For an additional charge, we can provide "Canopy Booths" which have red-and-white-striped canvas tops to provide shade and protection from the elements. However, we are glad to do the complete set-up and take-down, and to provide operators for the games as well. Simply ask for a quote for us to do the whole thing! Delivery and pickup is extra, however, many groups also arrange for Fund Resources to provide inflatables, concessions, tables, chairs, tents, etc. for the event, so let's see what you are planning - we can quote the most economical delivery fee, or it may even be included in the price of the rental of inflatables. Click any of the following to learn more about how Fund Resources can help with your event or to return to the previous page!